The USATF-NE Race Walking Grand Prix utilizes all NE Championship events as well as open races, and is scored on age-graded performances with the best 4 performances totaled for scoring. All scorers must be USATF members in the New England, Maine, or Connecticut associations (NE states). Sep 25 Pepperell Rail Trail 8K/4K, Pepperell MA 10:00 a.m.
Nov 6 USATF-CT Association 10,000m championship, Clinton CT 10:00 a.m.
800m Race Walk (Boys & Girls comb), track events start at 9 a.m.
1 Mile Race Walk (Men/Women comb), 2:30 p.m. The USATF-NE Race Walking Grand Prix is scored on age-graded performances with the best 4 performances totaled for scoring. All scorers must be USATF members in the New England, Maine, or Connecticut associations (NE states). Congratulations to 2015 USATF-NE Grand Prix winners Bob Keating and Maegan Allen. Special recognition goes to our friends from Maine, Kayla Allen and Sydney Sirois, who were the top points leaders in the Women’s division. In all, five men and five women completed four events, with 29 athletes participating in at least one of our 11 Grand Prix races. The USA 1 Hour Walk returns to New England again in 2015 at Gloucester MA High School on the New Balance Track, Newell Stadium. The race also serves as the USATF-New England association championship. Note the change of schedule. The Men's and Women's events will be combined. The One Hour Race Walk will start at 9:00 AM. Prize money to the top 3 male and female finishers who are eligible to represent the USA in international competition at the senior level. Awards to the first 3 overall male and female competitors in the Novice / Youth Mile Race. Registration Form, Entry Status and USATF National web page. The USATF-NE indoor season began with a 1 mile race at MIT's Johnson Athletic Center. Now serving as the USATF New England indoor championship, the event is the first USATF-NE named race walk - The Tom Knatt 1 Mile Walk. Long a supporter and promoter of walking in this area, Tom is a strong proponent of the indoor 1 mile, among his favorite race distances. 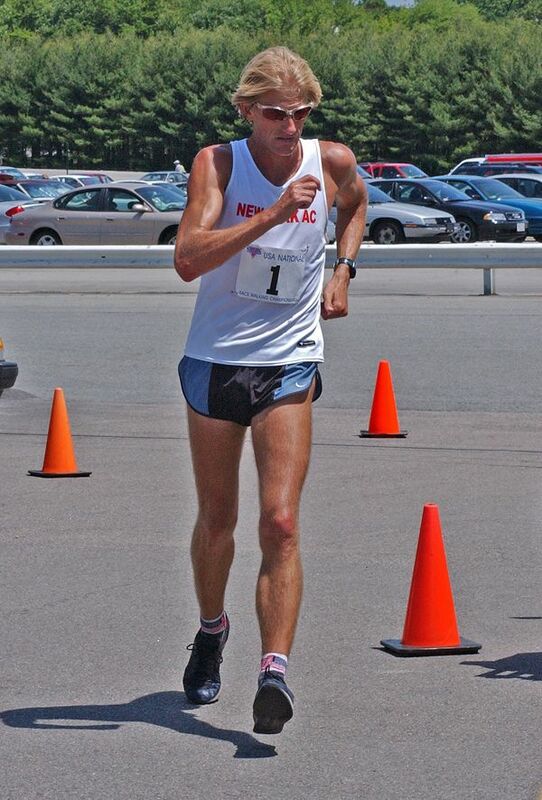 The New England association hosted the USA 1 Hour Race Walk Championship at Newell Stadium, Gloucester MA. The event also served as the USATF New England Championship. A clinic and an all-comers race were part of the event. The USATF-NE Racewalking Grand Prix is scored on age-graded performances with the best 4 performances totaled for scoring. The New England association hosts the 25th annual USA vs Canada match at East Boston Park. An all-comers 3K, youth/novice 2K, and clinic are included. Meet Information. 10:15 a.m. Youth / Novice 2 km. 10:15 a.m. All-comers 3 km. Juniors are athletes fourteen (14) years of age or older and will not turn twenty (20) in 2013. US and Canadian Junior teams consist of 3 to 6 scoring athletes per country. The US team was selected from the finish order of the 2013 USATF Junior Nationals 10,000m walks at Drake University in Des Moines IA in June. Youth age 14 and under may compete in the 2 km race walk scheduled for 10:15 AM. All-comers may compete in the 3 km race walk also scheduled for 10:15 AM. The USATF-NE Racewalking Grand Prix is scored on age-graded performances, the best 4 performances totaled for scoring. All scorers must be USATF members in the New England, Maine, or Connecticut associations (NE states). The 2010 USATF National One Hour Race Walk Championship was held on Sunday, October 3 at Bentley University in Waltham, MA. Click here the complete results, including lap sheets and judges summaries. NEWalker Series - Second Sunday of the month from April through September. The 2009 USATF National One Hour Race Walk Championship was held on Sunday, October 11 at Bentley University in Waltham, MA. Click here complete results, including laps sheet and judge's summaries. Waltham Track Club had 4 competitors in the Junior Olympic Nationals walks - the largest number of NE walkers to ever compete in the meet. John Henry Fitzgerald (WTC) placed fifth, winning a medal in the Intermediate Boys (15-16) division. John Henry Fitzgerald                                                   ? ?           ? Larry Epstein's 15 Minutes in Stoneham video. The 2008 USATF National One Hour Race Walk Championship races were help on Sunday, October 12 at Bentley College in Waltham, MA. Click here for results..
NE Masters 5000 meter race walk was held at Springfield College, July 27, 2008. RESULTS. The USATF-NE Racewalking Grand Prix is scored on age-graded performances, the best 4 performances totaled for scoring. Bob Keating and Maryanne Daniel repeat as GP champions. At the USATF convention, New England was awarded the USA One Hour Championship for junior, open, and masters for 2008, 2009, and 2010. The site will be Bentley College in Waltham MA. Marcia Rutledge (NEWalkers/Newton MA) was named outstanding female race walker for 2007 in the 45-49 age group by USATF Masters Committee. The 2007 USATF National One Hour Race Walk Championship races were held October 14 at Bentley College in Waltham, MA. Click here for complete results including lap sheet, judges summaries and photos. Shannon O'Donnell (Princeton MA) won a bronze medal at the USATF Youth Athletics Championship in Lisle IL in July. The Princeton MA resident walked 9:05.78 for a personal best, the first national youth age group medal ever by a New England girl. The association's oldest member for many years, and the NEWalkers oldest member died on October 19. A late starter in the event, he still holds US records in the age 90-94 division. The New England 1 Hour Championship, an event that he held 2 US records, will be named in his honor. October 15 at Bentley College - Waltham, MA. National 15K Race Walk Champion Curt Clausen. USA 15K Championship, Sunday, August 7, Watertown MA. Mainers Carly Lochala and Adam Staier win East Region 1 Hour Championship, October 17 at Bentley College, Waltham MA. Click here for complete results. Joanne Dow (Manchester NH) placed second at the US Olympic Trials on July 18. Because the US only had one athlete with the "A" standard - Joanne - they could only send one walker to Athens; that being winner Teresa Vaill, who has the required B entry standard. 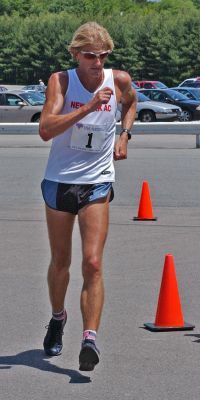 On Sunday, June 13 in Lincoln RI, Olympian Curt Clausen won the USA 15K Racewalk Championship in the first USA National walk held in RI in 40 years. Teresa Vaill was both the women's open and masters winner, and established a masters 15K record, and a record for longest time between open championships - 20 years. October 12, W.P.I., Worcester MA Click for complete results. New England Walkers is the most active race walk club in the New England states. 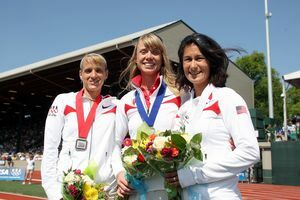 They regularly host National championships - most frequently, the USA One Hour Racewalk Championship - and coordinate the USATF-NE racewalk Grand Prix. Their competitive team ranges from age 16 to 70+. Visit the NEW site for the newsletter and archives, schedules, clinics and more. The Connecticut Racewalkers is the largest racewalking club in Connnecticut, and members regularly cross the boarder into Mass. or Rhode Island. The Maine Racewalkers has a piece of almost all racewalking activity in the state of Maine, including their successful high school program. Ohio Race Walker - The longest running print publication covering the sport - 50 years - ceased publication in March 2015. Basic non-competitive walking using Core Integration technique, it combines the best techniques and learnings from tai chi, yoga, from Feldenkrais principles to recent body science of the past 50 years- to enable better posture, a stronger core and greater overall health.